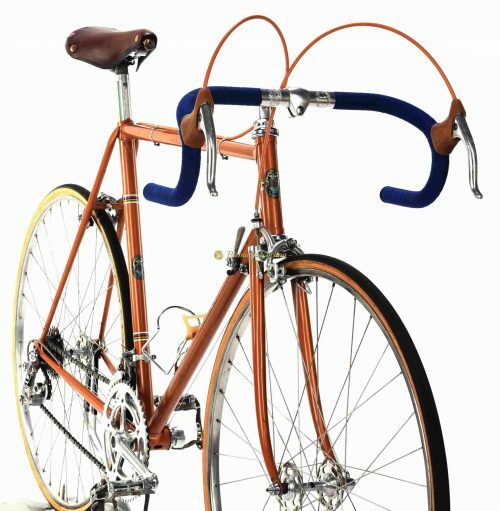 The Special is one of the most appreciated bikes, launched early 1960s, handmade in Masi’s famous workshop at the Vigorelli velodrome in Milan, Italy. Very likely made of Reynolds tubing (Masi never told exactly what tubes he used). Like all his frames also this one shows extraordinray details and lugs which were carefully filled and customized for highest performance. A trully work of art. Proudly presenting this highly collectible jewel, one of the most beautiful bikes in our store, the MASI Special, made by Faliero Masi. Extraordinary details of lugs, tubes and headbadge makes you understand why most of the top cyclist in 1960s/70s were racing with bikes made by ”The Tailor”. It’s not a surprise that also Eddy Merckx was racing with exact same frameset while ridding for FAEMA Team. The frameset dates back to late 1960s/eary 1970s, equipped with superb Campagnolo Nuovo Record groupset with high flange Record hubs, original Brooks saddle, Cinelli stem and handlebar. Love at first sight. Very nice catch for any vintage bike lovers. L’Eroica ready. Condition: Used, but good condition. Original paint and decals. Some signs of normal use. All parts are working fine.